The Signature Llewellyn frame is built by my hands to a very high standard of meticulous construction with no short cuts in the process or cost-cutting decisions on materials and processes. 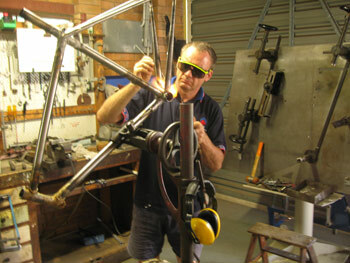 My Lucentezza frames get publicity, but the majority of the frames I build are built to my Signature finish level. The use of lug construction allows me to show my signature metal working style by shaping the lug’s shorelines and thinning the lug surface. This hand element makes each Llewellyn frame unique. No Llewellyn frame is the same. The tubing is selected from the top of range Columbus seamless cold-drawn double butted tubing to suit each client’s frame. The lugs used are designed and produced by me to include all the features desired to give trouble free service. Things such as stress free seat post clamping, M6 stainless steel binder bolts, integral gear cable mounts, and many more features which are all blended in to achieve pleasing aesthetics. I join the frame tubes in the lugs by silver brazing using very expensive, low-temperature, 56% silver content brazing rod to ensure the maximum mechanical properties of the tubing is retained. The single individual brazing steps I insert in the frame’s construction are more time consuming, even pedantic, but they ensure each frame and fork is built to a controlled high-level of alignment without in built stresses from cold setting corrections. This results in a longer lasting frame with the desired sweet and controlled handling qualities. All braze on fittings are made of investment cast or machined stainless steel even if they are painted over. This is to ensure that over time there are never issues with corrosion in vulnerable areas from perspiration salts etc. 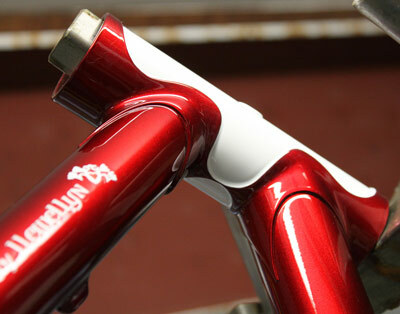 All Llewellyn frames are given polished proprietary stainless steel dropouts which keeps the dropout area tidy and paint chip free from repeated wheel removal and insertion. The head tube badge is polished stainless steel and is silver brazed in place, no rivets or screws, done just for a classical finish and expressing the highest levels of bespoke frame metal working in your frame. The front derailleur braze on boss is stainless steel and the mounting face is polished to give a blemish free appearance: no clamps, no paint squishing, or chipping. The hands free stainless steel chain hanger really works when the rear wheel is removed. Stainless steel frame parts are not a skin-thick veneer like chrome plating so scratches and chips do not produce visible marks. There will never be any flaking or rust lifting that chrome plating is prone to suffer. After many years/decades of use your Llewellyn frame can have pristine refurbishing which is facilitated by the original use of stainless steel. A reworking of the surface/polishing during the repainting process and the frame is brand new again. 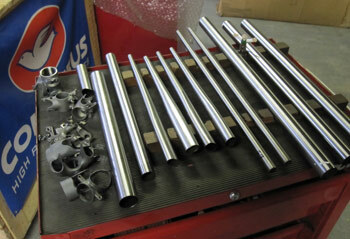 No original Llewellyn frame will ever have chrome plating as a concession to ease or economy of production. The paint magic (wet paint) is done by my long-time acquaintance and award winning painter Joe Cosgrove. I still do all the demasking and polishing. As extra protection the frames are internally treated with a special corrosion-preventive oil. The little details add up to a great frame that will give you many years of cherished riding. All Llewellyn models are available as Signature frames. 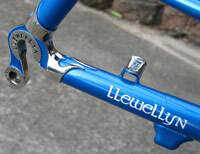 Proprietary Llewellyn lug set (Track frame includes rear Llewellyn track dropouts with replaceable stainless steel wheel facets). 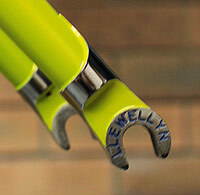 Polished stainless steel Llewellyn dropouts front and rear. Polished stainless steel front derailleur boss. 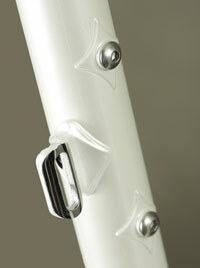 Polished stainless steel seat stay heart detail. Polished stainless steel “QuickChanger” chain hanger. 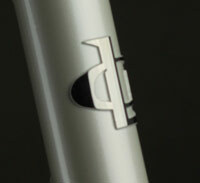 Polished stainless steel head tube badge. 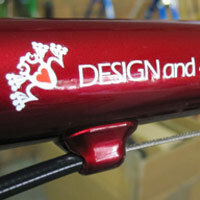 Customer’s name decals on the top tube (sealed under the clear coats). Matching Llewellyn machined and painted headset spacers Manorina and Custodian frames if required. Lucentezza finish level. Hand carved and polished stainless steel lugs and details. No chrome!